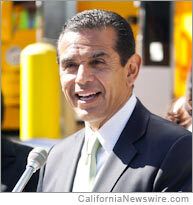 LOS ANGELES, Calif. /California Newswire/ — Mayor Antonio Villaraigosa and the City Council on Friday officially commenced American Indian Heritage Month and honored the 35th anniversary of the Los Angeles City/County Native American Indian Commission. The event themed “Many Tribal Nations, One Community” recognized the diverse, indigenous communities in the City of Los Angeles. Los Angeles is the only major city in the United States to create and support the development of a Native American Indian Commission, and celebrate American Indian Heritage. The Commission’s 35th anniversary also marks the 135th anniversary of the Battle of the Little Big Horn. The Los Angeles City/ County Native American Indian Commission was created on June 25, 1976 through a joint effort of members of the Los Angeles American Indian community to improve the delivery of federal, state, local resources and services to urban Indian communities. Los Angeles has the largest urban Indian population in the United States. Through the Commission, local American Indian residents have the opportunity to impact the decisions and programs that affect their lives. This year’s Heritage Month sponsors included ABC7, Media Image PR, The Walt Disney Company, Time Warner Cable, Bank of America, SEIU and Southern California Edison. American Indian Heritage Month launches a month-long calendar of cultural events, arts activities, and free music classes for elementary, middle, and high school students presented by the City of Los Angeles, The Walt Disney Company, Nielsen, Fox Audience Strategy, and the Department of Cultural Affairs (DCA) through its Music LA Program. The music classes celebrate, preserve, and promote various Southern California native music traditions. American Indian musical and cultural forms are explored and presented in their historical contexts, relying heavily on precious knowledge passed down generation after generation through oral tradition and inter-generational teaching. A list of all activities and events is available at www.culturela.org. For more information, call (213) 922-9762, or follow the Heritage month Facebook page at www.facebook.com/HeritageLA. United American Indian Involvement, Inc.’s (UAII) Seven Generations Child and Family Counseling Services will work together with Southern California Indian Center, Inc. to offer the fifth annual Music LA American Indian Heritage Month Program for youth, focusing on the song and dance traditions of the pow wow. Activities that will be incorporated in UAII’s 8-week Music LA Program are Drumming, Singing, Dancing, Arena Traditions, and Regalia Design. Pukúu will offer 8 weeks of Music LA classes for youth ages 6 though 18 at the Rudy Ortega Sr. Park in San Fernando. This program will focus on the music, song, and dance of two Southern California Tribes, Quechan and Tataviam.